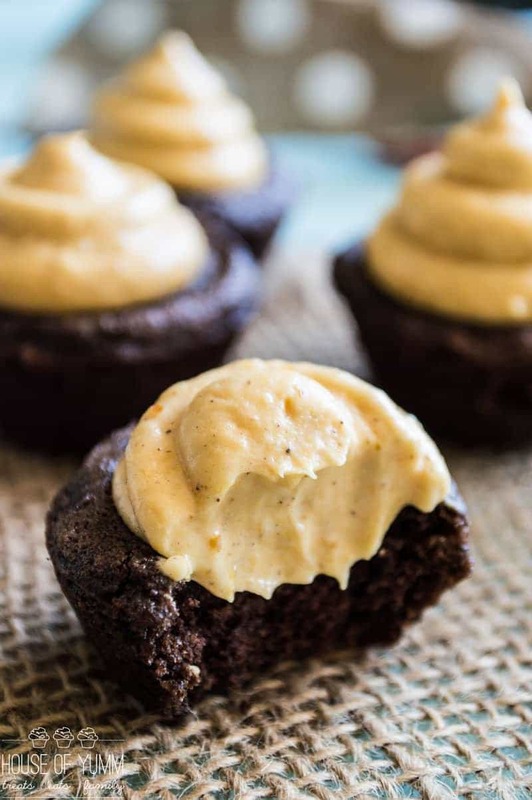 Soft and chewy Chocolate Cookie Cups filled with a smooth and creamy Pumpkin Pie Cream Cheese Frosting, the perfect mini dessert for Fall, or all year long! 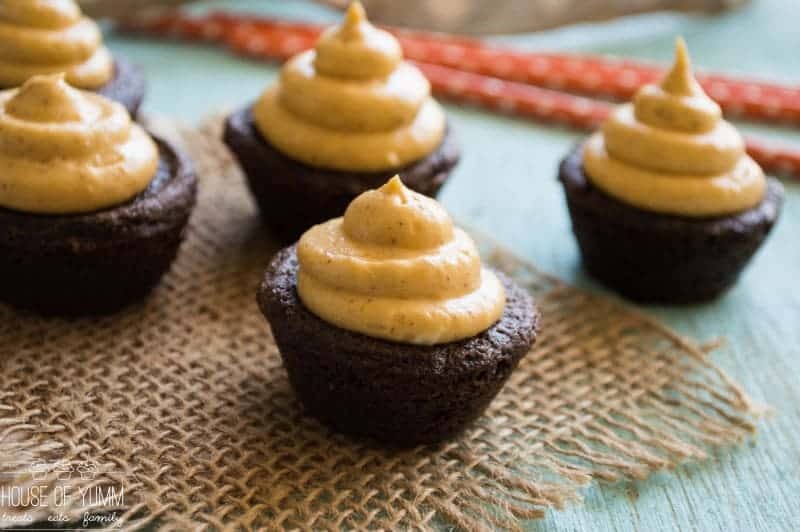 These mini cookie cup treats were so easy to make, plus the frosting tastes just like my favorite pumpkin pie. Pumpkin pie with the addition of a moist, chewy chocolate cookie cup underneath. Pumpkin and chocolate. Perfection. The frosting is thick, creamy and spiced with cinnamon, ginger and cloves. Just look at how smooth that frosting is. There’s nothing better than piles of frosting on top of a dessert. I’m slightly obsessed with the muted orange color and spice specks in the frosting too. So pretty! 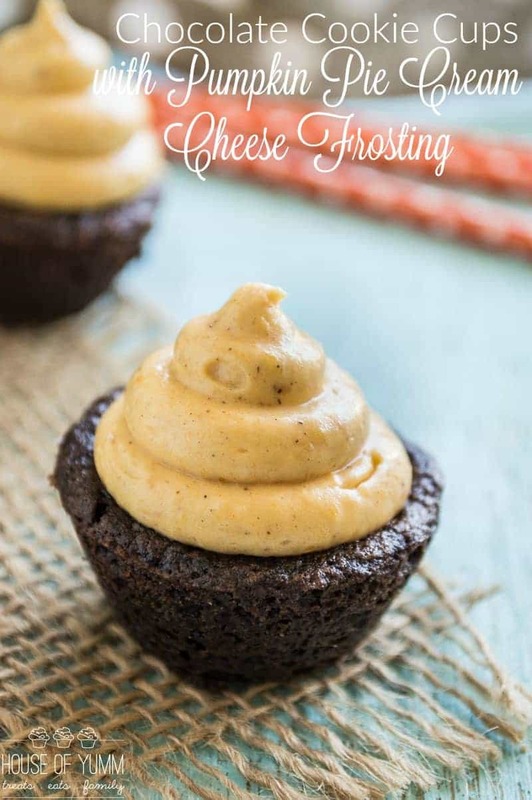 The frosting is made by mixing together cream cheese, a small amount of butter and pumpkin puree. The cream cheese and the butter both need to be at room temperature. If these are cold when the frosting is mixed up there will be small chunks of cream cheese and butter left, making the frosting lumpy. No one wants lumpy frosting. Easiest way to prevent the lumps is to bring both of those ingredients to room temperature. Set them out on the counter abut 20-30 minutes before you’ll be using them. Preheat oven to 350 degrees. Add the butter to the mixer bowl and beat over low speed for a few seconds. Add the sugar and mix until butter and sugar are fluffy. Add in the eggs and vanilla, beat over medium speed until completely combined together. In a medium size bowl mix together the flour, baking soda, and salt. Stir together until mixed. Add dry ingredients slowly into the mixing bowl and mix with low speed until fully combined. Add in the cocoa powder and mix over low speed until fully combined, scrape sides of bowl with rubber spatula as needed. Using a spoon scoop a 1 inch ball of dough and place onto a greased mini muffin tin. Bake cookie cups for approximately 10-12 minutes, cookies will still be soft when removed from the oven but will be able to have centers pressed down with a spoon to create a crater and not be doughy in the middle. Allow the cookie cups to cool in the pan for an additional 5 minutes. To remove from muffin tin lightly hold onto the edges of the cookie cup and twist, this will loosen the cookie cup from the pan and will allow it to be removed easily! Set cookie cups onto a wire rack to continue cooling. To prepare the frosting place the room temperature cream cheese and butter into mixing bowl. Beat with medium speed until fully mixed and smooth. Add in the pumpkin puree and spices. Mix until combined. Slowly add the powdered sugar and mix with a low speed, scrape down the sides as needed. Frosting will be thick and creamy. Add to piping bag, I used a Wilton 2A tip. Once cookie cups are cooled top with frosting. Serve immediately. Store at room temperature in a sealed container.